Kenya is renowned for its unparalleled wildlife, habitat diversity and fascinating cultural heritage. A wide range of ecological zones—semi-arid plains and vast savannahs, tropical mountain forests, a rugged Northern Frontier, and the Great Rift Valley—provide for a tremendous array of fauna and flora. On this photo safari in Kenya we will take you to explore the best-known and most distinguished parks and reserves in East Africa, with a special emphasis on wildlife photography. During this trip we will visit 4 different locations though out Kenya. Samburu Game Reserve, OL Pejeta Conservancy, Lake Naivasha, and the fabulous Maasai Mara where we will experience the annual wildebeest migration! Located in Kenya’s Northern Frontier District. We will enjoy the magnificent scenery of this region, exploring the area for wildlife characteristically found here. Grevy’s Zebra, Somali Ostrich, Beisa Oryx, Gerenuk, Olive Baboon, Guenther’s Dik-dik and Reticulated Giraffe thrive in this harsh but picturesque landscape. This is the land of the Samburu tribesmen, a pastoral people related to the Masai. The women wear layers of beads inchoker fashion around their necks, and the men are famous for their colorful adornment and high-jumping dances. Morning and afternoon game drives allow ample time to explore this unique area and observe its abundant wildlife. Sweetwaters is in the slopes of Mt. Kenya and overlooks a floodlit waterhole offering visitors an unforgettable opportunity to view and shoot pictures of animals in their natural habitat. Our main targets here are rhinos! Both White and Black Rhinos are present here. Elephants, reticulated giraffes, black-backed jackals, lions and all other African wildlife are abundant here at the conservancy. Optional walking safari escorted by a knowledgeable Ranger. Bird-walks, Camel safaris, Chimpanzee observed from a Boat on the Ewaso Nyiro River which supports other wild game like Elephants, Buffalo, Baboon, Eland, Silver-backed Jackals, Ostrich, Rhino among others. The only freshwater lake in the Rift Valley. From the top of the Rift Valley escarpment, you can see the lake sparkling under the sun thousands of feet below you. The lake is home to a large colony of hippos and it’s also a Mecca for bird watchers and researchers since over 400 different species of birds have been recorded here. It’s on the beautiful shores of Lake Naivasha that Joy Adamson author of the bestseller book “Born free” lived; her home Elsamere is now a wildlife education and conservation center. This northern extension of the Serengeti ecosystem, one of the world’s most rewarding wildlife observation sites, virtually throbs with life. 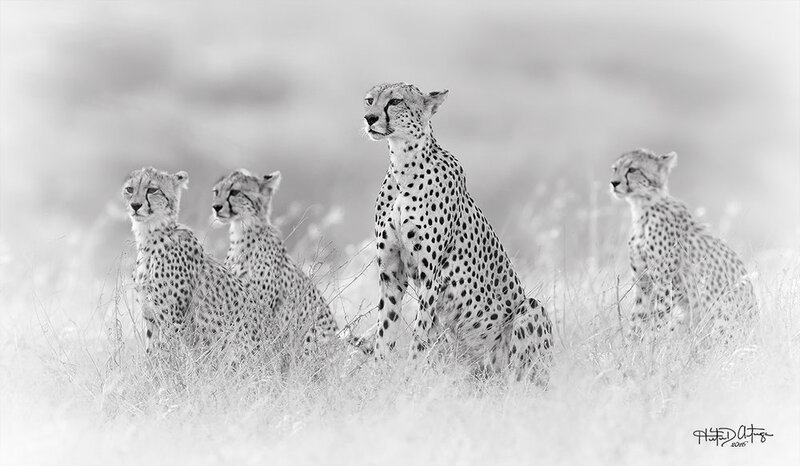 The rich savannah is famous for its concentration of plains game and their predators, including Leopard, Cheetah and hyena. As we take off through the Great Rift Valley, we will pass the extinct volcanoes of Mt. Longonot and Mt. Suswa. We will begin to see Masai herding their cattle, as we arrive at Masai Mara. The Masai, perhaps the best-known and most colorful African group, still follow their traditional ways as semi-nomadic pastoralists. Young warriors carry spears and decorate themselves with red ochre, and the women wear elaborate and beautiful beadwork. The social life of the Masai makes them a fascinating and special people, and we shall see their herds and villages among the plains animals through much of our journey. For the gallery of Kenya images from the past 2 photo tours click here. - All land transportation within Kenya. - In-country flights to and from the Maasai Mara. - Accomodations at the finest lodges / tent camps. All with in suite facilities. - Full board accommodations whilst on Safari. - 4x4 Land Cruiser with every photographer having their own seat row. - All meals (excludes drinks). - Bottled water during game drives. - All transfers from airport, hotels, lodges and tented camps. - All National Park and Game Reserve Entry Fees. - Membership in the Flying Doctors Program / East Africa. - Boat rides at Lake Naivasha. - Airfare to and from Nairobi, Kenya. - Bottled drinks w/ meals. - Items of personal nature, such as laundry, phone calls, alcoholic beverages, souvenirs, etc. - Gratuities for local guide / drivers. We are limiting the number of photographers to 6 so you can get our full attention and be very comfortable at all shooting locations and during transport with your photo gear. A $2500 deposit is required at the time of enrollment with full payment due by April 1, 2019. Deposits and tour/workshop fees are non-refundable.